This product is case packed in quantities of 25 per carton. A break carton fee of $11.00 will be applied to orders that are not placed in case denominations of 25 units. This table number holder is a great way to identify different items that are on display in bakeries, retail stores, cafes, buffets, and more. 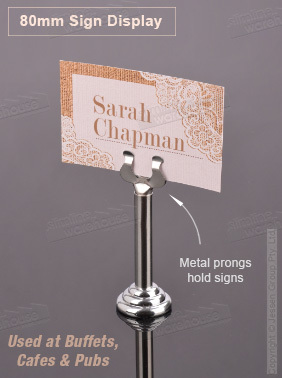 The place card holders are also great for helping visitors find their table at weddings and special events, as the versatile displays provide an elegant stand that is able to be used at formal events. The stands are 80mm tall to be seen by visitors easily when amongst decorations and items. This table number holder, like many other hospitality displays, is made of stainless steel to ensure long-lasting use no matter where the unit is used. The stand uses a polished finish to offer a stylish display that matches any décor. The tiered base of the display is weighted as well, helping to provide a stable display that remains upright during use. Order these inexpensive wedding place card displays today for your next event! Click here to see our expansive online catalogue full of hundreds of displays that can be used outfit your business with high-quality displays that are offered at some of the lowest prices found online. Slimline Warehouse offers same day despatch with most in stock items that are purchased by 1pm EST to anywhere in Australia, including Sydney, Melbourne, Perth, Brisbane, Adelaide, Hobart, & Gold Coast!